Most People called this char yoke, meaning fried pork. The pork is fried then braised. It's similar braising pork like hong shao rou. The dish is flavoured predominantly with red fermented beancurd and five spice powder. Quite a simple recipe, other than the flavourings there are only two ingredients pork and woodears. Probably the only recipe that uses the most woodears in my experience. Not the prettiest dish but quite tasty with plain rice and some steamed or fried green vegetables. The pork is tender and the woodears are soft yet slightly crunchy. Do not substitute red fermented beancurd with white fermented beancurd, the flavour is different. Mix pork with the marinade and leave in the fridge for 2 hours or overnight. Soak woodears in water till softened then tear into pieces and remove the hard stem. If you using the large thick type, when soaked some can be expanded to 5 - 6 inches wide. Because this takes quite a while to stew best use thick woodears, flimsy ones or ready shredded may be too soft after stewing. Heat oil in wok till hot then fry the pork in several batches at medium high heat till golden brown. Be careful oil may spit due to the pork skin, don't get too close. If the oil starts spitting turn the heat down. When done remove pork and place in large metal sieve, large spider skimmer or colander to drain off any excess fat. 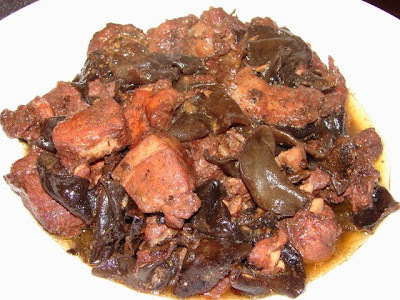 This pork can be eaten like this without stewing, quite nice too. When frying is done, remove oil and wash the wok because they could be a sticky layer on the wok. Heat about 1 - 2 tbsp of oil and fry the garlic then add in the red fermented beancurd and five spice, stir fry till fragrant. Add a splash of shaoshing wine. Add in the pork and woodears. Stir for a while. Add enough boiling water to nearly cover pork and woodears. Let this boil for 2 - 3 minutes, cover with lid and lower heat to simmer for about 40 minutes or till the meat is tender. Taste if salty, then add light soy and/or oyster sauce and pinch of ground pepper. 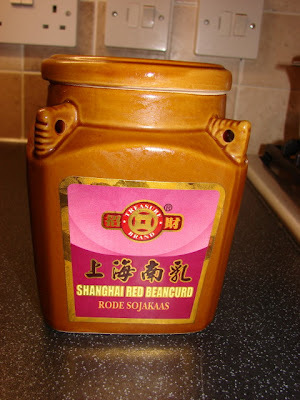 I had used so many different types of fermented red beancurd; in tin (can), glass jar and ceramic jars. My latest favourite is this one below. It's from Shanghai with a nice ceramic jar, suitable for storing garlic later. The fermented beancurd and juice are stored in a plastic bag, so the jar is not stained. The beancurds are quite large not the tinny squares. The smell is much nicer than any other brands I had tried. I can smell a nice fragrance from the fermented red yeast rice 紅麴米 . (Red yeast rice is what gives this fermented beancurd the deep red colour). Truly recommend this. Not the cheapest around £3+ for a jar. Do keep fermented red beancurd in fridge if you are not using it often. Prolong storing at room temp. or in a warm room can over ferment it and it could smell sour or foul. That's a nice jar! WHere did you buy the Nam Yu from? My mum uses the one from the can - I don't think it's that nice - not very fragrant. I got this from my local small Chinese grocery store. May be available in other supermarkets. Have a look around. Try Wing Yip or other big supermarkets. My last jar was also ceramic, round with a teddy pattern, flavour not as nice as this square jar. Canned nam yu is not that nice. It's sterilised don't get that extra flavour with live fermentation. This looks very delicious. Just sooooo good with rice. Nam yu somehow always brings great flavour to meat dishes. Thanks Mary. I love nam yu my staple in this house. I have cooked this a few times now using your recipe. Love it.